It was just brilliant on the 7th October to hear Andrew Marr speak on drawing and its importance as an enrichment of life and bringer of joy to all who practice on any level. At the official opening of DRAW14, the 93rd Annual Open Exhibition of the Society of Graphic Fine Art, he was of course talking to terminally addicted artists, as well as to all the guests at the presentation evening. We all hugely appreciated the time he spent with us so. 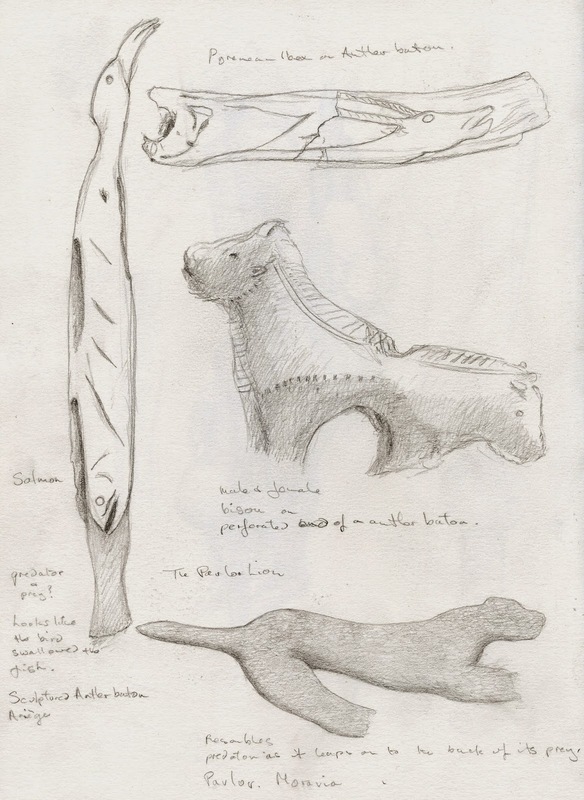 I was particularly excited by Andrew’s reference to the Ice Age Art exhibition at the British Museum last year, which showed many beautifully observed carved objects from between 20,000 and 40,000 years ago. He went on to relate that study of these artifacts has shown that particular makers hands can be identified and that in some cases their improvement over time can be observed. This seems positively mind blowing to me. On my two visits to the exhibition, I was overwhelmed to be in some sort meeting face to face with such ancient cultures. 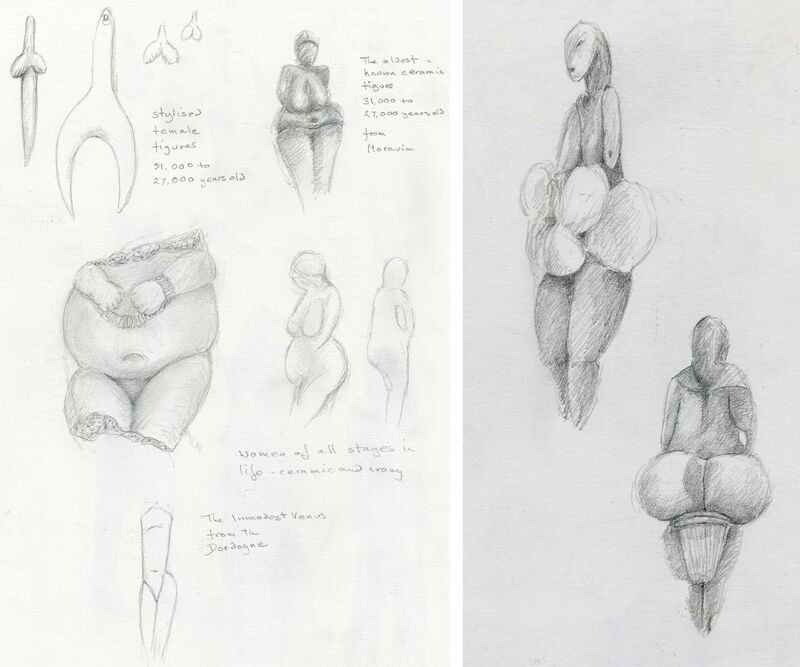 This was accentuated by the small scale of the objects such that you really looked at the individual marks made. As recorded in an earlier post I was excited by the incredible accuracy of observations of animals so important for their survival. 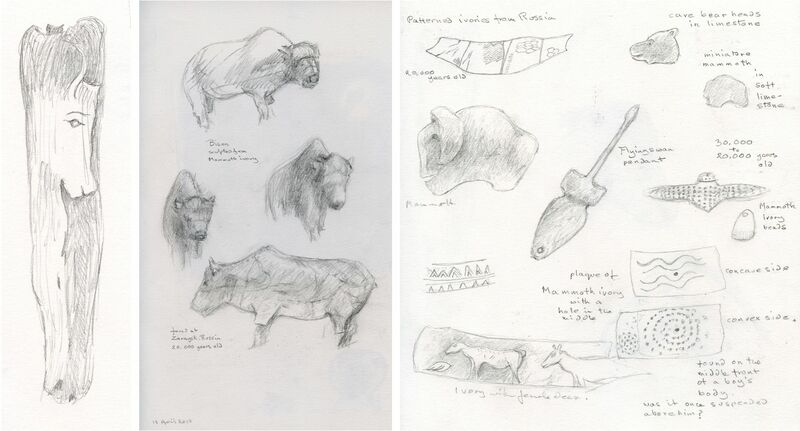 Some of the original drawings from my sketch book are below, including the one of the carving which inspired my lithograph, Food Chain. All those years ago these hunter gatherers must have seen birds that swallow fish as direct competition for a vital food source. I found that particular carving such a wonderful mix of observation and imagination. and Animals carved out of bone, ivory and antlers. We may not know why these objects were made or what they were used for, but we do know that the same creative spirit continues to breathe through all artistic endeavour today. Tomorrow evening Tuesday 7th October, the Society of Graphic Fine Art is greatly privileged that Andrew Marr will be opening the exhibition and presenting the awards at around 6.30pm. This is the Society of Graphic Fine Art’s 93rd Open Annual Exhibition, and hotfoot from assisting with the hang and take in on Sunday I have seen at first hand this exciting show of fine art drawing take shape. I am sure our illustrious former members; Sir Frank Brangwyn, the first president, Dame Laura Knight, and Ronald Searle would be pleased to see such a varied and innovative display from contemporary artists, and wonder what they would have made of the ‘Remembrances’ of World War One, chosen as our optional theme this year which will constitute a significant and poignant part of the exhibition. It must have been so much more raw in the minds of the students of Frank Emanuel’s etching class at the Central School of Art, who with their teacher, gave birth to the Society in 1919. 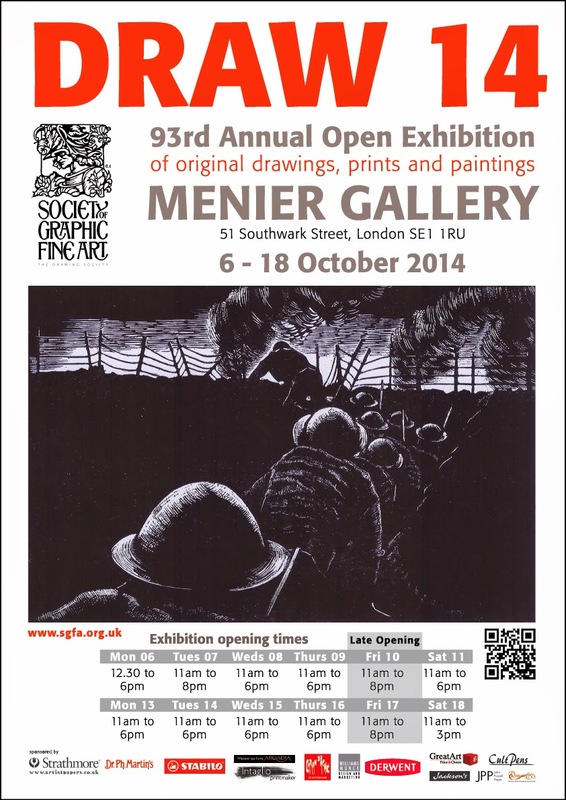 Originally known as the Society of Graphic Artists, the Society’s first exhibition was held in 1921 with Sir Frank Brangwyn as President. Anyone who has donned the white gloves and had the privilege of viewing Brangwyn’s Flanders lithographs at the Imperial War Museum, will know the power of those images. Today I am impressed and thankful that war artists are now as engaged with the victims of war as with those fighting in war zones. The Society was so privileged earlier in the year to have George Butler speak to us and to see at first hand the drawings he made in Syria. Visit the Society of Graphic Fine Art online to find out more about our artists and events and a feature on George Butler in the wordpress journal archive.